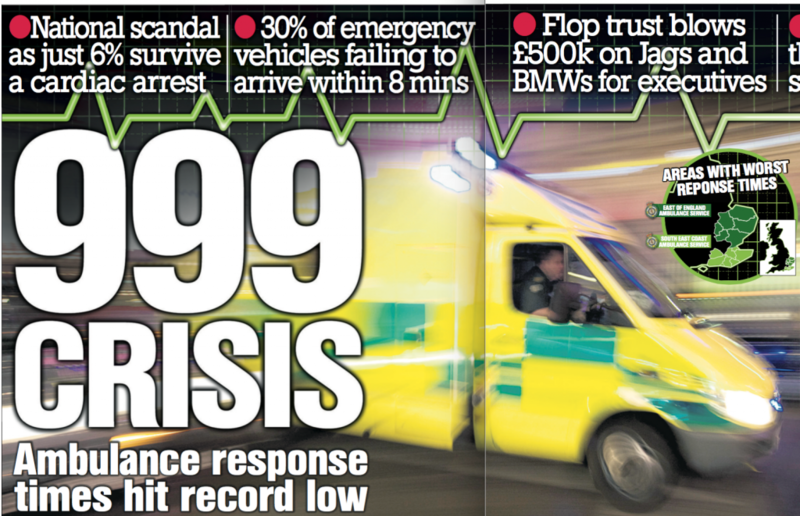 AMBULANCE response times in the UK are at a record low, with thousands of patients dying needlessly every year. The news comes as a Sun on Sunday investigation finds that just 6.2 per cent of people in England survive a cardiac arrest when taken to hospital by ambulance. This drops to as low as three per cent in the worst areas. The best countries in Europe have rates as high as 25 per cent. The latest figures, from May, show that in the past year almost 30 per cent of ambulances in England failed to reach the most serious cases in eight minutes. The Government target is for 75 per cent of ambulances to respond in this time. The East of England Ambulance Service — covering Essex, Norfolk, Suffolk, Bedfordshire, Hertfordshire and Cambridgeshire — has the worst record (63.4 per cent within eight minutes). It also has one of the worst cardiac survival rates. The next worst is South East Coast Ambulance Service — covering Sussex, Kent, Surrey and North East Hampshire — at 66.4 per cent. 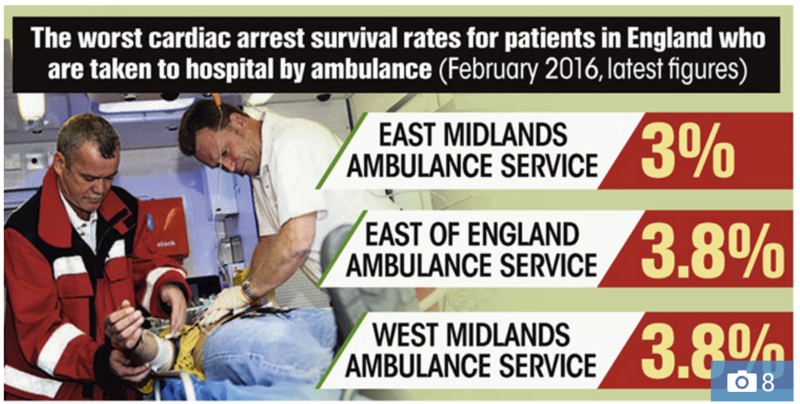 The deadliest area for cardiac arrest sufferers is the East Midlands, where just three per cent survive. 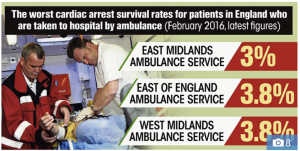 In February this year — the latest month for which cardiac survival figures are available — East Midlands ambulances took 261 cardiac patients to hospital, with only ten surviving. The next worst survival rates are found in the East of England and West Midlands, both on 3.8 per cent. Last night campaigners said it was clear that delays were costing lives. Despite the catalogue of failures, we found that some trust bosses are raking in bigger salaries than the Prime Minister’s £143,462. East of England Ambulance Service chief executive Robert Morton is paid £142,000 a year. In May it was revealed that the trust was forking out nearly £500,000 in lease payments for Jaguar and BMW cars for its execs. South East Coast Ambulance Service NHS Trust chief executive Paul Sutton Paul Sutton received a package of £225,000. He quit this year after ordering a scheme to delay sending ambulances to calls coming in via the 111 line. East Midlands paid its chief executive £145,000 last year. Last night the TaxPayers’ Alliance called for an end to the bosses’ gravy train. 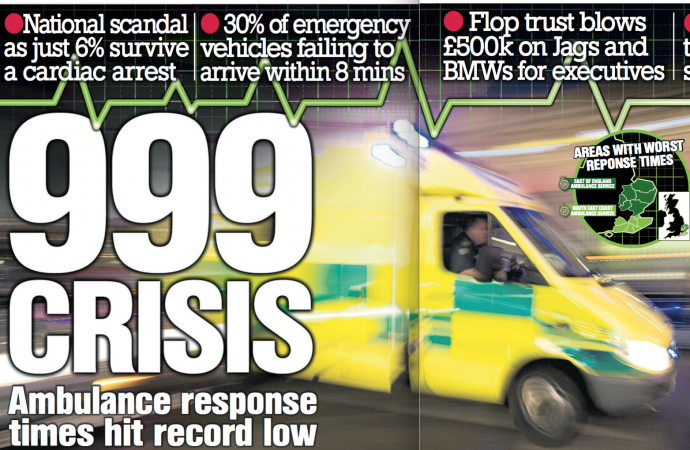 NHS England points to soaring demand for ambulances for putting the service under intense pressure. A record 10.8million emergency calls were made to ambulance services in England in the past year, up 7.1 per cent over 12 months. Unions and patients’ groups blame Government cuts for a recruitment crisis that has crippled the service. They say the situation is made worse by people calling ambulances when they have difficulty getting appointments to see a GP. In May, 70.5 per cent of ambulances in England were reaching the most seriously ill patients within eight minutes, down from 76.9 per cent last year. The monthly average for England did not hit the Government target once in the past 12 months. Scotland did worse than England on response rates. 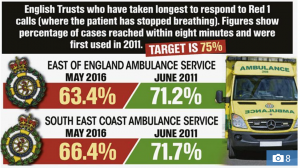 Ambulances there reached just 68.3 per cent of the most serious calls on time. Wales bucked the trend with a 75.5 per cent average. But even their results varied widely, from 62.3 per cent in Powys to 82 per cent in Cardiff & Vale. The Welsh cardiac arrest survival rate was 12.2 per cent. Scotland does not record cardiac figures in the same way. Northern Ireland has by far the worst response times in the UK. 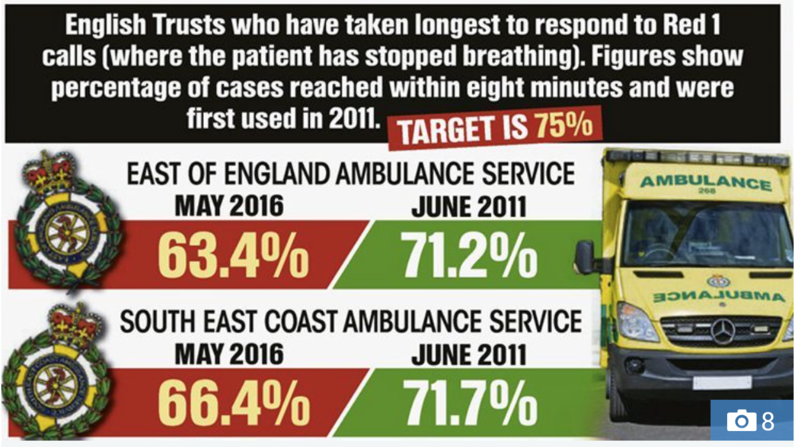 Its ambulances reached just 51.1 per cent of the most serious cases on time between April and June. A spokeswoman blamed increased demand on the service, hospital turnaround delays and reorganisation of acute services. Response rates have been getting steadily worse since the Government first started publishing figures four years ago. The proportion of people surviving cardiac arrests has also been falling, with a two per cent drop — equivalent to 56 additional deaths — since the same time last year. Areas where CPR is taught in schools generally have higher survival rates. But the UK’s failure to match rates from countries such as Norway (25 per cent) and the province of North Holland (21 per cent) is a death sentence for around 470 people a month. A South East Coast Ambulance Service spokesman said it was “working hard to meet the current high levels of demand” and “had a plan in place” including recruiting more front-line staff. East Midlands medical director Dr Bob Winter said: “All ambulance trusts are measured on how many patients are taken into hospital alive after suffering a cardiac arrest. The West Midlands Ambulance Service was unavailable for comment.